Planting Zones: 6, 7, 8, 9 Plant Type: Deciduous Light requirements: Full Sun Soil Conditions: Well Drained Height at Maturity: 6 - 10 ft Growth Rate: Medium Fruiting: Yes Bloom Color: White Bloom Season: Spring, Summer Ships bare root. 5-10'' at time of shipping. As the Austin Blueberry plant flowers later in spring, it is less susceptible to late winter or early spring freezes. 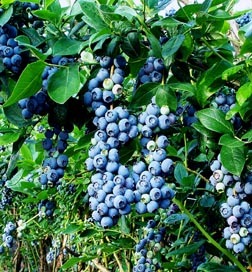 Typical of rabbiteye cultivars, the Austin Blueberry requires less mulching and less organic matter.